[news] Singer Tei and f(x) Krystal spotted together at a recording studio! 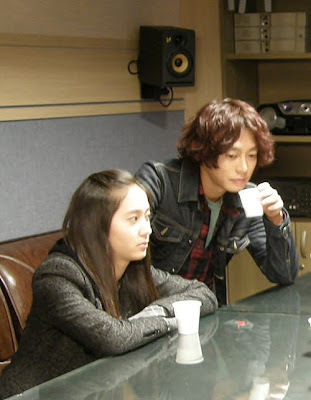 Photo's of Singer Tei and f(x) member Krystal spending time at a recording studio has surfaced online! Krystal and Tei are seen in the photo in a strange atmosphere with seriousness on their faces and looks like they are working on a secret project. Both Krystal and Tei are actually working on a "Melody project". "Melody Project 'MusicDrama' Part.1" was released back in March which Singer Alex sung "Sweet dreams" and featured f(x) Krystal and Tei, they are working on the part 2 for the melody project. This project they are working on is "Melody" which will be released on May 28 through various music portal sites.